Well hey, sisters! This week's reading really couldn't have come at a better time. In fact, I am actually glad that I didn't get a chance to post last week as this is so fitting for what has gone on in Sydney this week. 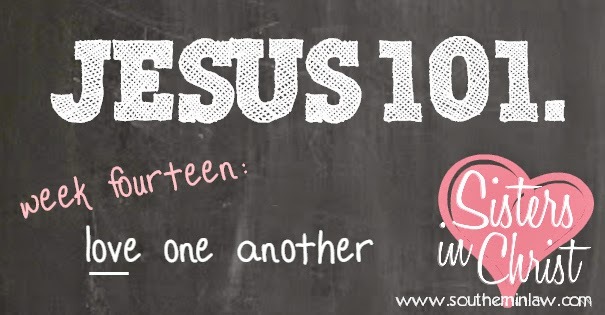 This week, we're looking at John 13 where we learn about what happened on the night before Jesus's crucifixion - but whilst there are so many things that happen in this chapter (which I really encourage you to read through as a whole), there is one command Jesus gives that I want to focus on. Jesus says to His disciples, "A new command I give you: Love one another. As I have loved you, so you must love one another. By this everyone will know that you are my disciples, if you love one another". Jesus says that everyone will know that we are His through our love for others. But this isn't the only place we read that. We are told time and time and time again that we need to love EVERYONE - not just our friends and family, not just those who help us or those who we admire or even those who love us in return - everyone. But how do we really love people all of the time? Is it possible? People can be irritating, there's no doubting that - even our fellow brothers and sisters in Christ can be difficult to love. Sometimes it's hard enough to love even our own family. How do we achieve what Jesus has asked of us? Loving people is difficult, however, it is what the Bible commands. "For this is the message you have heard from the beginning: we should love one another" (1 John 3:11). I think what made the biggest difference for me when it comes to loving others was when I really thought about what it meant to love others the way that God loves us. Think of it this way: God loved us not because we had something to offer him, but rather because He had something to offer us. God loved us so that He could demonstrate His mercy to us through Jesus. Love is both an action and a feeling. When we love others, it's a doing thing - a verb. We can love others without loving them in the romantic sense. Biblical love is an active interest in the well-being of others. Love that acts for the benefit of others. But we can't do it alone. God is waiting, ready to forgive us for our lack of love. He wants to show His mercy towards us, to cleanse our loveless hearts and fill it with His loving Holy Spirit. By placing our trust in Christ, we allow Him to teach us to love the way that He loves us. Hello everyone i want to share a live testimony on how Dr Makuta was able to bring my husband back to me, myself and my husband were on a serious breakup, even before then we were always quarreling fighting and doing different ungodly act..
Today my family is back again and we are happy living fine and healthy, with Dr Makuta all my dream came through in re_uniting my marriage, friends in case you need the help of Dr Makuta kindly mail him on( makutaspelltemple@gmail.com OR CALL +2347063332716 ) Sir i will forever recommend you!!! I am Alice from New York USA,I want to use this golden opportunity to appreciate the great spell caster called Dr.makuta for helping me get back my relationship with my ex lover when he ended and turned his back on me for quite a long period of time. Dr.makuta performed a spell for me and within 48 hours after the spell had been cast i receive a call from my ex saying that he is sorry for hurting me and that he will not do such thing to me in his life again, I was surprised but later accepted him back. Anyone that is in the same line of problem or having difficulties in there marriages or any part of life should contact Dr.makuta email address:makutaspelltemple@gmail.com OR +2348110035171. ..I am Alice from New York USA,I want to use this golden opportunity to appreciate the great spell caster called Dr.makuta for helping me get back my relationship with my ex lover when he ended and turned his back on me for quite a long period of time. Dr.makuta performed a spell for me and within 48 hours after the spell had been cast i receive a call from my ex saying that he is sorry for hurting me and that he will not do such thing to me in his life again, I was surprised but later accepted him back. Anyone that is in the same line of problem or having difficulties in there marriages or any part of life should contact Dr.makuta email address:makutaspelltemple@gmail.com OR +2348110035171 ..
Are you guys still together? So I can totally relate to your situation! I fact I have been searching the Web in hope to find some advice or direction. You see I have been in a LDR for 3 1/2 years. A long LDR years. Like you seth, (my more then just boyfriend, but we don't know what to call it :) ) meet online. We meet through Zoosk, the online dating site with facebook. However, we started our relationship messaging, leading to text messaging for 2 months. At about 3 months of talking to each other, and getting to know one another a lil better that day arrived. I was having car issues, and I decided I could set up my new system myself. WRONGO! well seth and I were texting and I told him I was struggling, and he said " I can come help!" (He lived about 30 minutes from my house at the time) we met at the corner Pie Shoppe for the first time. You know I never believed at love at first site, but it happened. From then ee were inseparable. After a year of being together, and after my mom past, I needed to get away. I moved, without him. I moved 1,200 miles away, to Texas. He lived in Pennsylvania. He knew I needed this to cope and to refind myself. Well now here we are 3 1/2 years later still apart! We have been in a relationship for 4 1/2 years. Kristy, I found your story online, I read it in hopes for sum direction. I feel like I am at my wits end. Seth and I had a plan, we made it in February of this year, he would move down here and we would finally start a life together. No more 2 times a year seeing each other! We could finally see each other everyday. Well he got a job offer in Pa. It changed everything. However, he didn't get the job. But it seems he may decided to stay in Pa. I am not ready to move back to Pa. I'm scared when we have the talk that he's gonna say, maybe we need one more year apart before we can be together! Honestly, I don't know if I can do that! I'm tired of not being able to start a life, tired of the distance. I don't understand why we can't just be together! Do you have any words of advice? ?? I don't want to lose him... but I don't want any more distance! I'm tired of this! Help please! Every long distance relationship is different so it's really hard to give advice, however, all of the tips in this post are what we found the most important for growing in our relationship whilst being so far apart. One thing we were always careful of was making "deadlines" so to speak. Long distance relationships are hard and often costly so whilst a "deadline" may work in a normal relationship - it's incredibly difficult when you're so far away. Whilst we would have loved to see each other every 6 months, sometimes we went as much as 2 1/2 years without seeing one another. Whilst we always kept our eyes fixed on the future we wanted - we were reasonable about the fact that sometimes we couldn't afford to stick to our "plan". I think patience is the absolute key when it comes to LDRs - you've got to realise it takes time and be prepared to put that time in - and the second most important thing is compromise. I'm guessing both of you probably like where you live, so unfortunately you have to make the decision of who's going to move - and that's a huge sacrifice! I totally just happened upon your blog and I'm so glad I did. I'm currently in a LDR with man from Australia (I'm in Texas). Things are going well, however the time difference is crazy. When it's evening here, he's just waking up. When I'm going to bed, it's the middle of the day for him. How did ya'll work past that? Oh the time difference was perhaps the hardest thing for us! Especially around December when there was this weird gap between daylight savings for each of us and the time difference was even worse than usual. We just found we had to forget about time as such as talk to one another whenever we could - but also understand that there were times during our days where we couldn't talk to one another because we both needed sleep - and we both needed to work/go to school! It's still weird for us with Jesse's family being over there but we find the easiest time for us to talk to them is either early in the morning for us (which is during the day for them) or at lunchtime on a weekday (when it's evening and they're home from work). I am about to start my long distance relationship. My boyfriend and I have been together for almost six months, and tomorrow he flies out to Lithuania. If there are any additional tips I would love to hear them, I need as much help as I can get especially because we are so young. I'll check it out, thank you! Hi! My boyfriend and I have been in LDR for more than 3 years now. He is coming back in two days and we will be finally together for indefinite period of time! I can't believe that it's happening and that we managed to wait that long. I am the happiest person in the world and I feel so strong and full of joy! It was soooo hard to wait but it's totally worth it. just wanted to share my happiness with you and show people in LDR that it's possible!!!!! Hi Kristy! Your story was so beautiful and inspiring!! Congratulations to you both for making things work! My boyfriend and I were in a LDR for a year right after we graduated college. I was so miserable! The only thing that got me through it was knowing that we were working towards moving in together after the year was over. We finally did and just spent the best possible year sharing our lives together. It was perfect, and we really feel as if we are right for each other. But now I'm starting graduate school in a new city, and he's getting a Master's in another city. And he wants to be a surgeon, which means another 4 years of medical school, and 5-6 years of residency in who knows where before we're sure we can control our geographic locations and be together again. I don't know what to do! We really love each other, but there's no end in sight. The worst part for me is the uncertainly, not knowing when we're going to finally be together. How did you survive so many years of distance without having a definite end date in mind? Hey Laura, it was definitely tough not having a specific end date in mind, however, we found hope in the fact that we knew there would be an end date because neither of us saw a future where we weren't together. You really just have to take it one step at a time - growing your relationship in any way possible and looking forward instead of focusing on times or dates that may only end in disappointment. Hey Kitty, I know exactly how you are feeling right now! Prior to first meeting Jesse things did seem really overwhelming and at times impossible - especially for Jesse. As we were living 10,000 miles away, the distance was totally incomprehensible for Jesse as he had never even travelled further than two states away - let alone overseas. I didn't see it as an issue as I had been to the US multiple times but it was still tough to deal with as everyone around me thought I was absolutely crazy thinking that I could ever be in a relationship with someone so far away. Just take it one step at a time and work towards seeing each other whenever you can - even if it's meeting half way!